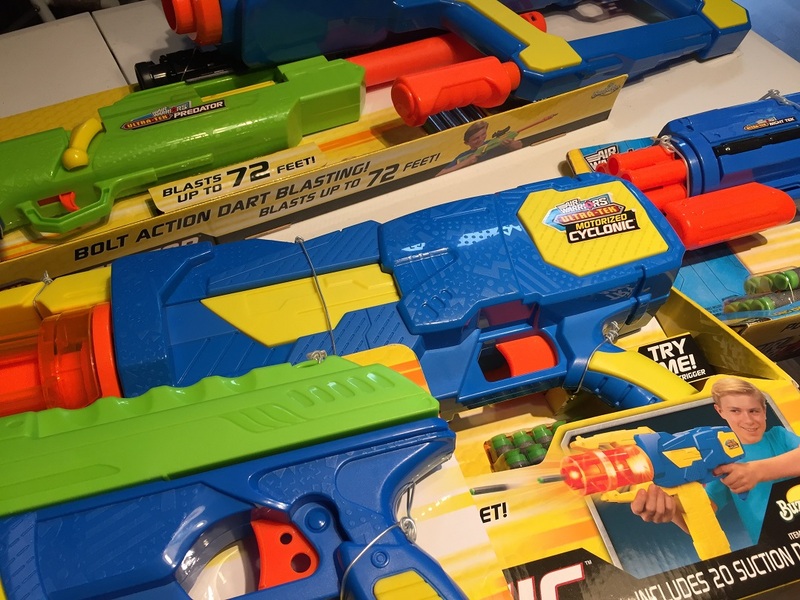 At Toy Fair 2016, there were more new blasters introduced than just about any year prior. 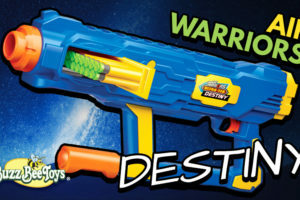 Hasbro, in particular, had a field day with new Nerf blasters of all shapes and sizes that they were eager to show-off. But for all of the excitement and spectacle, it was the Buzz Bee booth that contained perhaps the biggest surprise of the show. Not only was it a shock that Buzz Bee was there at all this year (thank you, parent company Alex Brands), they demonstrated prototypes of several models I never saw coming. One of these new models was the Air Warriors Ultra-Tek Destiny, and it was good. Really good. In fact, even in prototype form, it was one of my favorite blasters of the entire show. Now they’ve sent me one of the first Destiny models off the production line to actually test out, so let’s get to it! 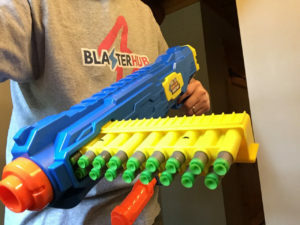 I’ve never hidden the fact that the BOOMco Rapid Madness is one of my favorite dart launchers of all time. 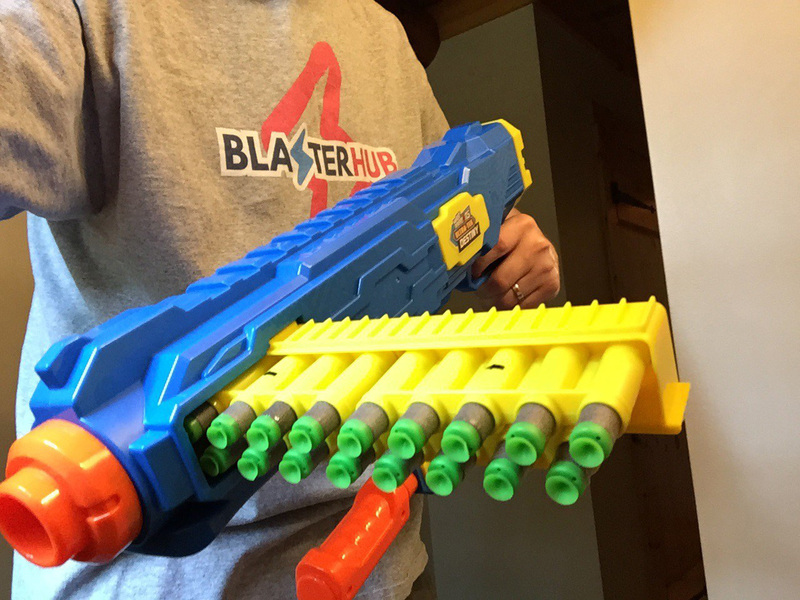 It’s a blaster that combines incredibly fast rates-of-fire (approximately 10 darts per second) with the satisfaction of a manual, pump-to-prime operation that has become increasingly rare in the toy blaster field. This air-powered model sounds great, and the “harmonica”-style clips make it reasonably easy to reload. But for everything I love about the Rapid Madness, it has always had one significant limitation: it could only fire BOOMco darts. The Ultra-Tek Destiny changes all that. 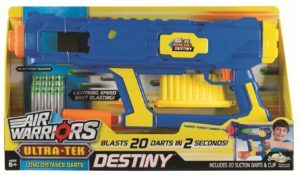 For better or worse (mostly better), the Ultra-Tek Destiny is essentially a Nerf-compatible version of the BOOMco Rapid Madness, but built to a price-point that leaves a few rough edges–both figurative and literal. For many, this is enough. The dream of a Nerf version of the Rapid Madness is really all that matters, and at a base level, the Destiny succeeds. In fact, although I don’t produce too many blaster reviews myself anymore (focusing instead on industry relations and news), trying out the Destiny at Toy Fair was enough to convince me that I had to review it. And I don’t regret that decision. 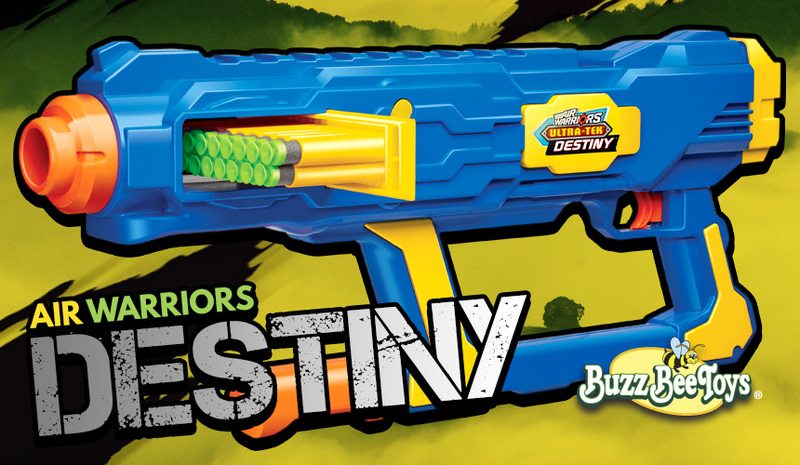 The Buzz Bee Air Warriors Ultra-Tek Destiny is a long name for what is an equally large product. This is a big blaster in both size and heft, a fact necessitated by the 20 dart clip and internal air bladder. 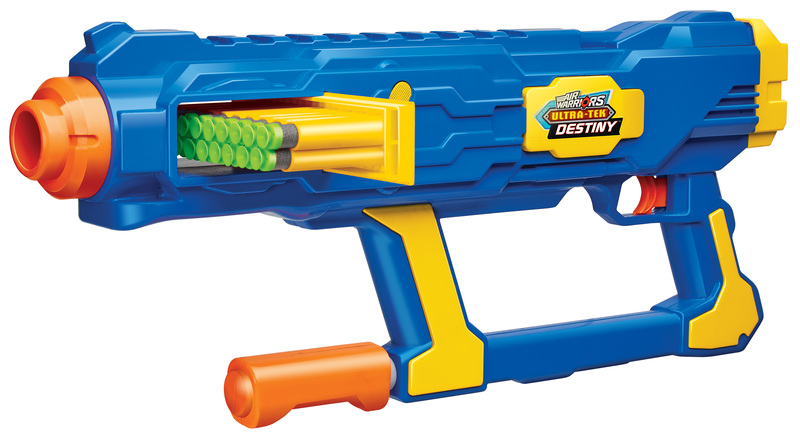 But unlike some Nerf blasters that handle their size gracefully, the Destiny looks and feels every bit as large as it is. Unfortunately, the Destiny’s visual heft is punctuated by surface detailing that incorporates shapes and elements that one might see on a children’s party toy. I’ve given it the nickname “fiesta,” for lack of a better term, but it’s really not something that makes me want to smile. In fact, quite the opposite. And it appears I’m not alone. 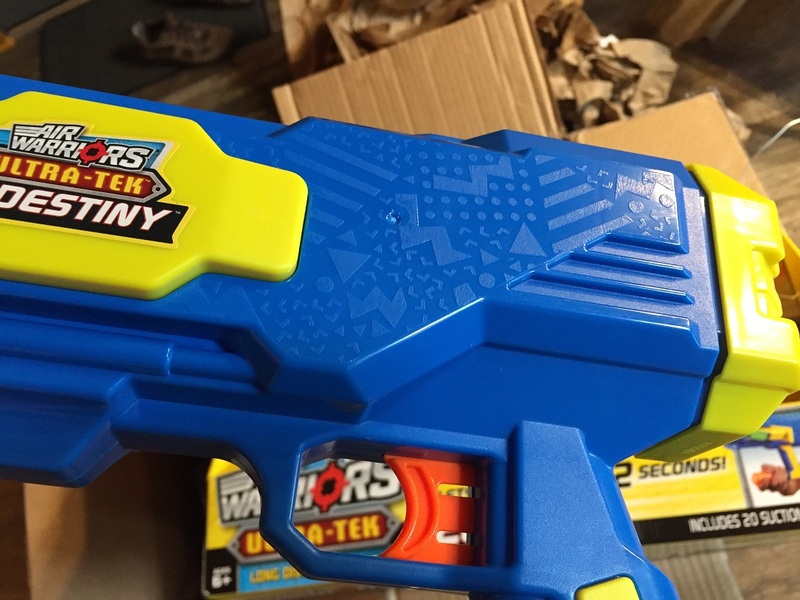 I reached out to my contacts at Buzz Bee concerning this new party pattern after realizing ALL of the Buzz Bee fall blaster samples I’d been sent show the same texture (and after blaster fans on Reddit expressed identical concerns regarding this new, more juvenile look). I was fortunate enough to have been given access to the Buzz Bee Vice President of Product Development, and he expressed the same concerns regarding the texture. Whether due to our immediate, negative feedback, or due to an internal misunderstanding, I’m now told this pattern will very shortly be replaced by a new, “carbon fiber” look that should bump-up the aesthetic appeal a bit. Look for it in stores soon. The Ultra-Tek Destiny is an air-powered blaster that requires roughly 18-20 pumps for maximum pressurization. Much more than that, and an internal pressure release valve goes to work–you’ll hear it kick-in at about 21-22 pumps. 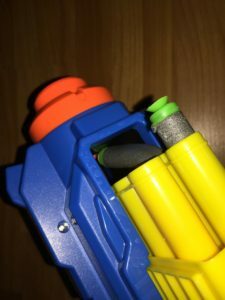 There’s no manual pressure release apart from the trigger, which becomes readily apparent when an entire 20-dart clip is fired, the blaster is set off to the side, and it decides to fire another shot or two completely autonomously. This happened repeatedly on my sample, and although mildly disconcerting, it didn’t really cause any operational problems. 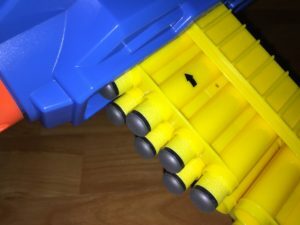 I was told by Buzz Bee that it was possible the factory “left a little too much pressure capacity,” since they were focused on ensuring that all the darts get fired from a full clip, and that it likewise shoots at a high rate-of-fire. And shoot at a high rate-of-fire, it does! In fact, the Destiny fires through a full, 20-dart clip so quickly, it’s hard to accurately time just how quickly shots are fired. But after several failed attempts (my inability to stop the stopwatch quickly enough), I was able to pin down the Destiny at launching all 20 darts in no more than 1.5 seconds–that’s just over 13 darts per second! And yes, I’m well aware that modded, full-auto blasters are capable of far more speed than this, but we’re talking completely stock, off-the-shelf performance in a world where most blasters only get 1-2 darts per second. Frankly, this is an astonishing figure that is in excess of what the Rapid Madness is capable of achieving, and is probably somewhat conservative given my slow-draw timing abilities. I would not, in fact, be surprised if 15 darts per second or more was possible. Speaking of my lack of timing precision, the Destiny likewise lacks precision in how many darts it will fire with a single trigger press. On average, I was only capable of shooting in 2-4 dart bursts. I don’t believe I was ever able to shoot a single dart at a time, though I’m told by other reviewers it may be possible. 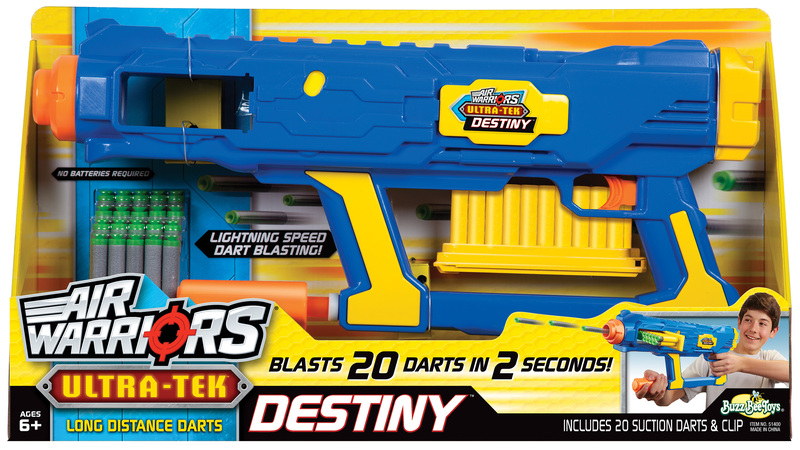 On the plus side, the Destiny is fully capable of firing darts from other brands–I tested both Nerf Elites and X-Shot Excel darts, and did not have any issues with either. What’s odd, however, is that I DID occasionally have jamming problems with the stock, Buzz Bee darts. Buzz Bee is no longer using the denser, darker charcoal-colored darts for some reason, which is a shame. Their newer darts are lighter, with more flexible bodies. They tend to fly farther than the older Buzz Bee darts, but are just as wayward as Nerf darts now, and seem to be more easily jammed. For what it’s worth, I didn’t experience any jamming issues with competitor’s darts. From this data (collected over repeated tests), I would conclude the following: 1) the Destiny is wildly inconsistent in dart propulsion–likely due to the changing pressure of the air tank in use, 2) the Destiny is capable of respectable FPS numbers (higher than the Rapid Madness), 3) the lowest performing darts are the ones that come in the box, 4) if you want the best, most consistent velocity, X-Shot Excel darts would appear to be your best bet. Now, I’ll note that I did not test every single dart currently on the market. I’m in the process of moving, so I only used the darts I had on-hand. Still, it’s interesting to note how sensitive the Destiny appears to be in what ammo is used–perhaps there’s a sealing issue at work, but whatever the case, it’s clear that you may see changes in performance based on what darts you chose. Fortunately, the Destiny appears to work with most of them. Lastly, when it comes to actually using the Destiny, it’s a little more fiddly than the BOOMco Rapid Madness. In particular, that “harmonica”-style clip doesn’t work with the blaster in a very precise manner, resulting in loading that often allows the blaster to miss the first shot or two (in too far), or not fire anything at all (not in far enough). There aren’t any observable detents or other markers to indicate when the clip has been properly seated. Even a small mark on the clip itself to indicate when it’s in far enough (or too far) would be helpful. So let’s talk about how much fun the Buzz Bee Ultra-Tek Destiny is to use. For starters, hand-pumping is so old-school these days you can’t help but love it. Sure, it’s not super practical in the middle of a fire-fight, but whatever. Take your LiPo’d, re-motored Stryfe with duct-taped 18s if you want to be competitive, and grab a Destiny if you just want to have fun. The visceral thrill of hearing 20 (twenty!) darts being propelled at roughly 70 FPS in only a second-and-a-half simply does not get old. Nor does the feel of air-powered recoil. Nor does the ability to use just about any dart in just about any condition. Nor does seeing the look on the faces of everyone around you when the beast is unleashed. While it may not be terribly easy on the eyes, the Destiny is simply a riot to use! No, the Destiny is not the flawless, Nerf clone of the Rapid Madness we had hoped. It struggles with a lot of design and refinement things that I wish it hadn’t. Yet, those things can still be overlooked pretty easily due to the fact that the Destiny will simply out-perform just about any other stock blaster on the market when it comes to rate-of-fire, including the fabled Rapid Madness. AND it will do it with any type of Nerf-compatible dart you can find at a price nearly anyone can afford, all while putting a smile on the face of anyone who uses it. That, by itself, is a dream come true. 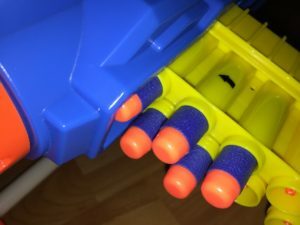 It’s a cheaper Rapid Madness that can shoot Nerf darts! 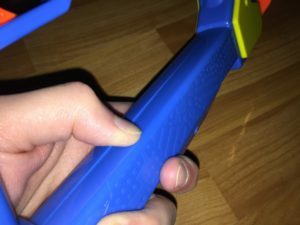 This entry was posted in Blaster Hub: Exclusive, Blaster Hub: Recommended, Reviews and tagged blaster, buzz bee, review on July 6, 2016 by PMindemann. Funny that bit you mention about having to insert the clip just right, my one has a small piece connected to the trigger that stops the clip going in too far when you insert it. As for the ROF, I think something as fast as the Destiny can’t be measured accurately by human actuated stop watch. I personally take a short video of the firing, then step through it with a video editor to get my measurements. The video I took on it (https://www.youtube.com/watch?v=rxR3VLkGr4o) clocked in at all 20 darts in exactly a second. At times it can fire a bit slower, but provided you pump it up fully, ROF doesn’t seem to drop below ~15dps. As for single shotting, give me an entire 20 clip and I can *probably* do it at least once, give me one chance at it and I’ll most likely fail. The trigger press time for a single shot is so short that I don’t think an ordinary person can reliably do it. For that sudden autonomous final shot thing, you can clear the rest of the air out by holding the release button on the right side and pulling the trigger. The box mentions it as a clip release as it releases the remaining air in the firing chamber (or something like that), thus retracting all the functional bits from the clipwell. As far as I can tell, it’s almost (if not completely) identical to the air release button on the Rapid Madness. Interesting about the pressure release. In discussing it with Buzz Bee’s VP of Product Development, he said, “pulling the trigger […] drains the extra pressure.” So, I think the “jam release” (as it’s actually denoted) is just that–a jam release. The pressure seems to primarily be relieved from the trigger. Regarding the ROF, I agree that it may be faster than I was able to capture via stopwatch in real-time (your video recording method is a good idea). But whether it’s 13 darts-per-second or 15 darts-per-second, it’s still pretty darn fast! Regardless, the jam release does solve the problem of that sudden autonomous last shot, as it vents the firing chamber while the trigger will clear the rest of the bladder (sounds like a bladder at least).